western red cedar cladding fitted to all elevations. fit guttering to soak away into flower beds. 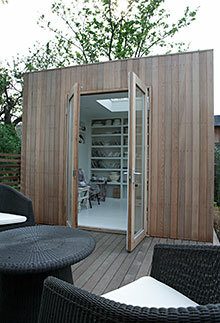 fit double glazed doors, windows and skylights finished in western cedar where specified. fit triple layer of felt roofing. lay solid wood floor, fit skirting boards and architrave. plaster and decorate walls and ceiling, decorate woodwork. fit thermal and accoustic insulation in cavity walls and ceiling. run exterior cable to main house fuse box. fit electric sockets, light switches and low voltage lighting where specified. fit light switch for studio in the house. fit electric oil filled radiator.